Philip Slagter is one of the artists who has lived and written the history of American Art in the last 50 years. Now, more than 70 years old (but not less active), he is considered one of the first artists of Pop Surrealism, among the most dynamic and lasting artistic movements purely American. Pop Surrealism was born in Los Angeles in the late 70s: it was the result of a subculture that came from the most diverse contexts, from comics to Tiki culture, through the hot-rod. A heterogeneous set of cultural references which fed daily the young artists of the time. As in all the experiences of his life (including the artistic one, of course), Philip Slagter followed a zig-zag trajectory, which enriched his cultural background and enhanced his artistic production. Born in the heart of the South Central United States, in Norman, Oklahoma, Philip had his first art lessons from his grandfather, an amateur painter, who taught him how to paint birds and animals. Then, he had his first contacts with “professional art” at Indiana State University, before moving to New York City to work as a graphic designer and illustrator. Here, in addition to the commercial culture of art, Philip came to know the nascent underground art (graffiti and street art), as well as ancient art, kept in the city’s museums. But his tour of USA was not over: from Connecticut to New Mexico, where he lived in the desert knowing the influence of the use of colors in a “no fear attitude” by the local Latin community. His journey then brought him more and more to the West: at the beginning of the 80s he moved to Los Angeles, and entered fully into the fervent artistic community of the city. He managed to sell the entire body of his work, and so he decided to go even further to the West, on the other side of the Pacific Ocean. 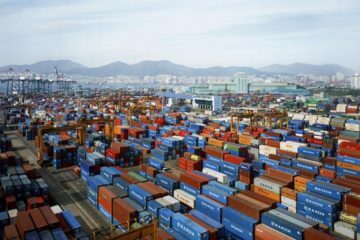 Thailand first, then Macau, China, Indonesia, Africa, interspersed with intermittent returns to the United States, where he painted many murals and sculptures for Las Vegas casinos like Mandala Bay, Bellagio and Luxor. In 2012, a dramatic mourning hit his seventeen-year-old daughter, who was very close to him. For four years the whole existence of Philip Slagter was “suspended”. He could no longer find the right strength for life and art. One day, however, thanks to the energy found in the memory of his daughter and his love for her, Philip has resumed painting, transferring in his artworks all the legacy of his long and multifaceted existence. Among his last exhibitions, he had an important show in 2017 at La Luz De Jesus Gallery in Los Angeles, California, one of the first and most renewed Pop Surrealism’s art galleries in the world. We’ll know his work better through an in-depth interview, which we will publish in 2 steps. The PhotoPhore: Speaking of Pop Surrealism: there are many cultural references at the base of this artistic movement. Do you have your idea about it? What the definition of this way of making art could be? 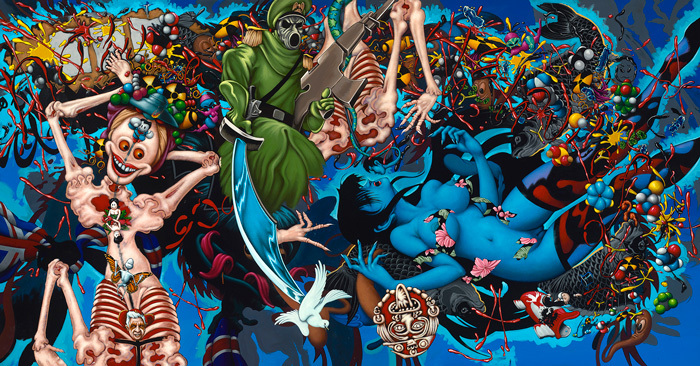 Philip Slagter: I don’t think I can define Pop Surrealism. That’s better left to historians, critics and the likes. Like most movements, artists were doing similar things decades and even centuries before bodies of work congealed into labeled movements. For instance Hieronymus Bosch. 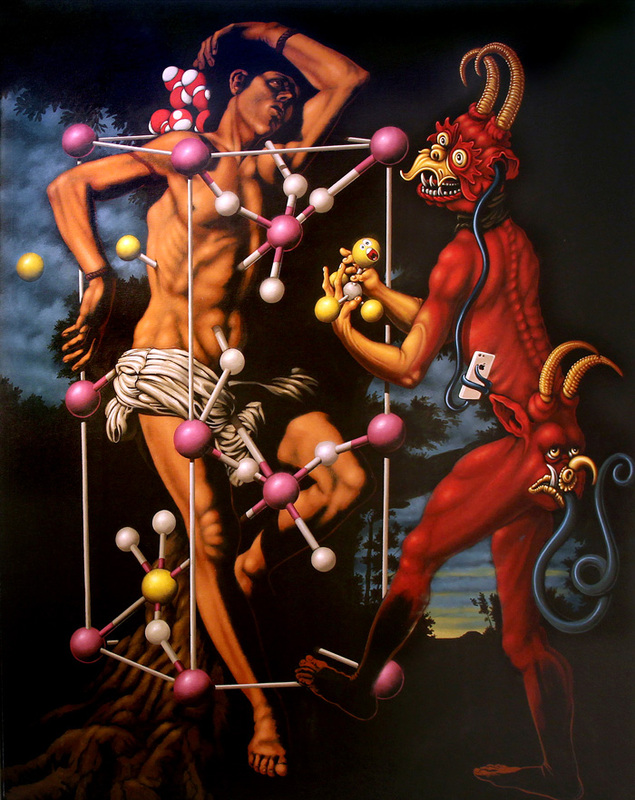 Could he be the father of Pop Surrealism and take the title away from Robert Williams? His work was certainly the reflection of the popular culture at the time. But there was no “art world” or gallery scene at the time so a movement wasn’t necessary. For me, I refer to all available historical reference of culture, whether past or present, as popular culture in this twenty-first, digital century of information and communication. So in that sense I do use pop images as my references. Billions of images are floating through hyperspace now. Thousands of these images are unconsciously imprinted in our brains. Pop Culture now changes within minutes as concepts, styles, images and memes “go viral“. So it seems to me that “Pop Surrealism” is now a historical movement and the public is just now becoming aware of it. So soon it will be replaced by the next “popular” movement. T.P.P. : What led you to this kind of art? P.S. : I don’t feel I was “led” to Pop Surrealism. I don’t even know if the label is appropriate for my work. It just seems to be the latest label applied to me by galleries. I understand the need for labels financially and possibly even historically but labels are a dangerous thing for the personal growth in every aspect of life, not only the arts. After all, if we accept the labels given to us, by ourselves or others, we close so many doors to other possibilities and find ourselves alone in a room from which we cannot escape. My work in the 1970s has aspects of this movement even though the label didn’t exist at the time. Remember, we had just come out of the Pop Art period of the 1960s. I was fond of the “underground comics” of the ’60s as well. Growing up in Indiana I was also aware of the “Hairy Who” group of artists in Chicago, Illinois. In my opinion, they certainly could be early progenitors of the movement now called “Pop Surrealism”. These were all influences but I consciously did not want to adapt to a style or be a part of any movement but rather choose my own path. Remember in the novel by Hermann Hesse, Siddhartha, when Siddhartha and Govinda met the Buddha and Govinda stayed with the Buddha as a disciple but Siddhartha went on his own path. And, paraphrased from memory, Siddhartha said to his friend: “How can I become the Buddha if I follow the Buddha?“. I was young and easily influenced by the idea that we could incorporate pop culture into art in a way that didn’t conform to the “rules“. In retrospect, I don’t believe I was conscious of this concept at the time. I was, simply put, “painting“ and reacting to life around me. The work I do now is just the extension of a life long process of exploration. An exploration of formal aspects but more importantly an exploration and celebration of the life around me, my life and everyone and everything’s relationship to it. T.P.P. : Today it is difficult to talk about artistic “movements”, which refer to a precise manifesto, as it was for the European “Futurism” or “Surrealism” of the early twentieth century. 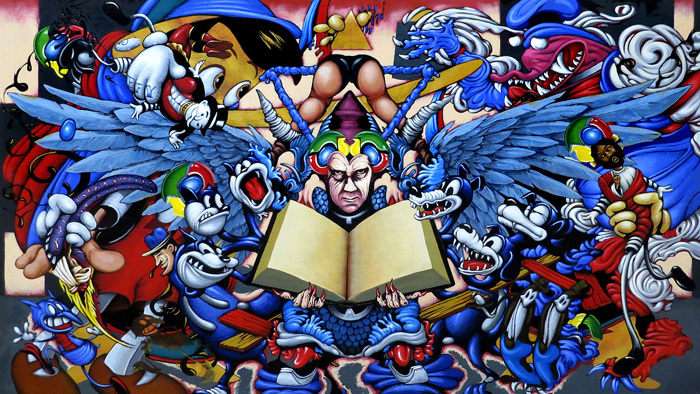 However, Pop Surrealism has had some forms of “definition”, especially in the Los Angeles area, through, for example, the journal Juxtapoz by Robert Williams. Do you feel part of this artistic trend? 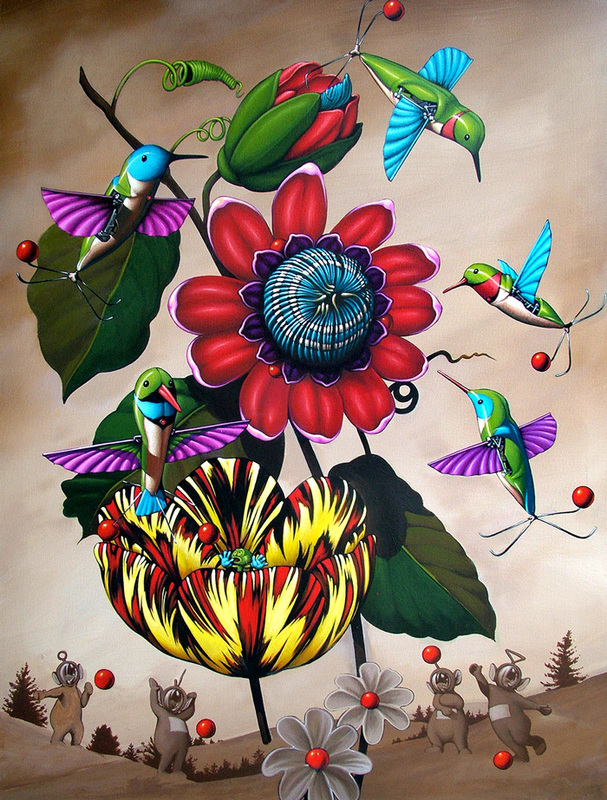 Did the idea of “Pop Surrealism” directly influence your art? If so, how? If not, why do you think not? P.S. : Even though it was never my intention I would have to say that I have been co-opted into this movement and in that sense, yes I am a part of it. I don’t feel constricted by this at all as I have successfully avoided turning my work towards any movement that I am aware of for 50 years now. By following any movement an artist limits their potential for discovery of the unknown outside and inside themselves. Of course I would have to say that “Pop Surrealism” has influenced my art but not any more so than any other individual artwork or movement I have been made aware of. The Fauves, Der Blaue Reiter, Surrealism, Cubism, Photo Realism, Ukiyo-e, Regional Wildlife Art, Anime all seem to be the same to me at their roots. Their roots being the artist alone and working. The “movements” come later for different reasons. My conscious goal as a young man was, as it is today, to pursue “truth“ or “reality“ through painting wherever it may take me. To adopt a movement for me would be stagnation. T.P.P. : Do you really believe that Pop Surrealism is a Lowbrow artistic movement? Or is it just a way to “stand out” from “traditional” art? P.S. : From my understanding Pop Surrealism grew out of the popularization of the term “Lowbrow Art” coined by Robert Williams as the title for the first book of his art. 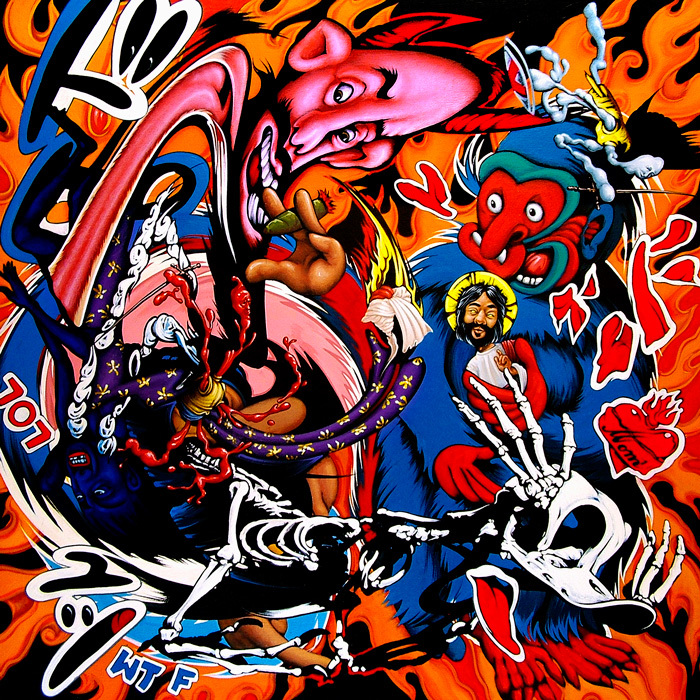 He named it “Lowbrow” in opposition to the popular term “Highbrow” art. As in all movements, the artists are working alone. Then for one of many reasons someone groups them together and labels their work. It might be for love of art but it may also be for financial or social gains as well. So yes, it is a way to stand out from traditional art or any other art label. But no more so than any other movements before it. For instance the beginning of the Avant-Garde movement in France and the later “gallery scene” it generated. There may be some correlation between the global populist movements currently happening and the interest in lowbrow or popular art. I have no doubt that out of it will come some artworks that sell for millions of dollars. As the power structures change so will the culture.